Saturday was one of those days. It started out relatively good with the boys and I, but it eventually progressed into a loud, messy mess. My youngest is nearly 20 months old and doesn’t go to daycare. It’s come time for him to get out more and be around other kids. So we’ve been going to a local Learn N’ Play group every other Saturday. Play group went well until it was nearly over. For an hour, the kids sing, paint, explore and play. Of course, there are snacks as well. My youngest has a tendency to stuff food in his mouth like a ravenous beast who doesn’t know when his next meal may come. All the while he is running around and being, well almost two. When it came time to sing the goodbye song, Chance decided he needed to roll around on the carpet while everyone was singing around him. And of course he had stuffed a whole cracker in his mouth. Then came the coughing and eventual choking and mom having to scrape wet cracker out of his mouth. Fun stuff. He was ok with some time on my lap and a little water. Apparently the oldest didn’t like the attention little brother was getting and decided he needed to get my attention too – in a bad way, of course. Shaun knows exactly how to push my buttons. Saturday was no different than any other day. He wasn’t listening. He was arguing and defiant to a degree. It subsided until late in the afternoon when he was seriously lacking a nap. I’d had one too many, “But, Mom, why’s” than I could stand. I yelled. I spanked and I sent him to his room. Then I felt guilty. Always with the guilt. I really never pictured myself being a mother. Before I had children, I had my horse and dogs. Furry “kids” sufficed. They were cared for better than I cared for myself and I had no qualms about it. I loved them and they loved me. I was 30 when I got married and 32 when I had my oldest. Some may call it selfish the way things have worked out, but I can tell you this, there are reasons I waited. I lacked patience. I lacked calm. I lacked knowledge. I still feel like I lose my cool way to easily and don’t know what the hell I am doing. But I do know I love those boys and they keep me on my toes. Saturday afternoon while they were both sleeping I had to get out of the house. I thought about saddling my old horse, but her feet were in unacceptable condition. So instead, I dug out the rope and roped the dummy. I hadn’t picked up a rope in years. It was therapeutic. Swinging (at times) the rope as hard as I could and catching the plastic calf head. I may or may not have smacked the rope down on the bale out of frustration from the day’s events. I was fed up and not happy with how this parenting gig was turning out. I wanted to be able to ride my horse whenever I wanted. I wanted to drive my pickup and go to a barrel race and not worry if I would be back late. I have been unhappy with this phase in my life, and probably not nearly vocal enough about it. I haven’t been to a barrel race in two years. I haven’t rode since early spring. It feels like a part of me is gone. I know barrel racing and riding are always possibilities, but it feels like I’m never going to have that special horse or have the “time” to ride and actually GO. 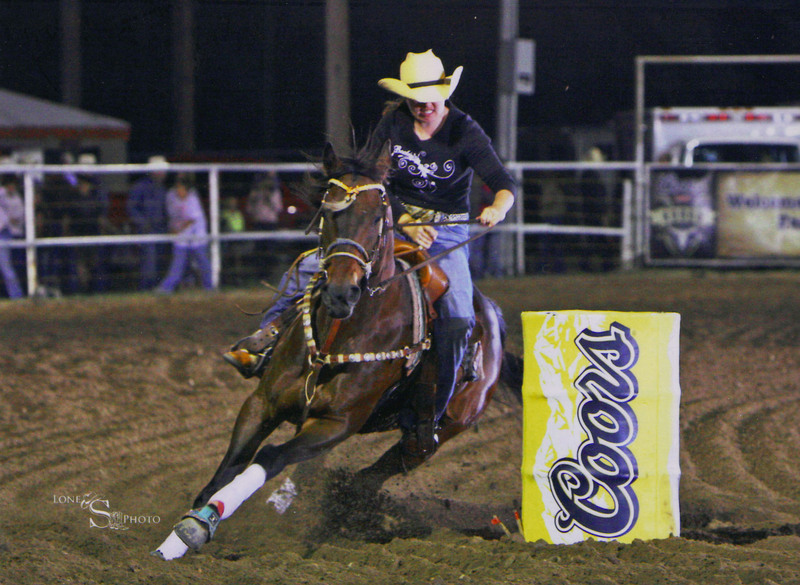 I want my boys to ride and eventually rodeo if they want to, but its hard for me to do that all by myself. It’s hard to saddle a horse when one kid is jumping around like a goon and the other one is screaming trying to claw his way up into the saddle before his brother gets there. I’m jealous of those mothers who several weeks after they had their latest kid are back in the saddle. They are more dedicated than I am, but in the end our situations are different. They don’t have old horses or a husband who works (what feels like) a million miles away. They are younger, have the desire to go and drag the kids along. I have hell dragging mine to the grocery store, much less a barrel race with a couple of horses. I’m sure there’s a solution, but I haven’t found mine yet. That or just come give me a swift kick in the pants. For what it’s worth, I’ve been in your shoes. I didn’t enjoy being cooped up in the house, looking out and seeing my horses and not being able to ride. I didn’t have daycare, a babysitter, a husband who got home in time to watch the three kids or help me with them and the horses. It’s so hard to see the moms who don’t seem to have to sacrifice anything. The years pass quicker than they seem like they will and you Will make it! Now my kids are my lifeline and well worth every tough day. Plus, they are my favorite people to ride with. Hang in there! Thank you! Some days are tougher than others. I really can’t wait for the day they both can ride with me and their dad. I just hope I can survive that long!